The first week in October (for 2016, it’s October 2 through 8) is Mental Illness Awareness Week, a time to focus on the troubling incidence of mental illness in our country and to try to erase the stigma surrounding it. This year, one way people will show alliance with the cause will be to wear badges of a sort, including T-shirts, hats, or custom silicone wristbands. The more people who align with the goals of the awareness week, the more we as a country will be able to improve the lives of those living with mental illness. Start to design your wish bracelets now! Approximately one out of every five U.S. adults experiences a mental illness in a given year, according to the National Alliance on Mental Illness (NAMI). 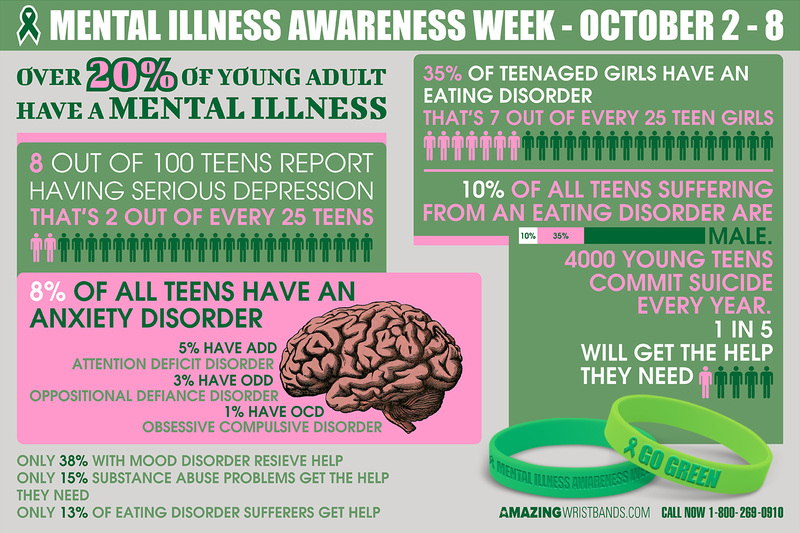 And one in five children aged 13 to 18 will experience a severe mental disorder some time in their life. The cost of mental illness is high—impacting homelessness, incarceration rates, and youth detention rates—so raising awareness during times such as Mental Illness Awareness Week is more crucial than ever. Because one of the goals of the week is to reduce the stigma that many people living with mental illness face, it’s important that people show solidarity with the cause. Taking the #StigmaFree pledge on NAMI’s site and spreading the word are good places to start. You can also use something like silicone wristbands to wear yourself or to give to friends and family as a reminder about the importance of understanding mental illness. You can customize the wristband with color, special effects like glitter, and special sayings such as "Stigma-free zone" or "Get Screened on National Depression Screening Day" or simply as "Mental Illness Awareness Week". 100% silicone so they are comfortable, durable, and non-allergenic. Offer cool special effects such as swirled or segmented colors, glitter, or glow in the dark. We do not charge a mold fee. We offer many different colors and color combinations. 5 to 10 days production available. 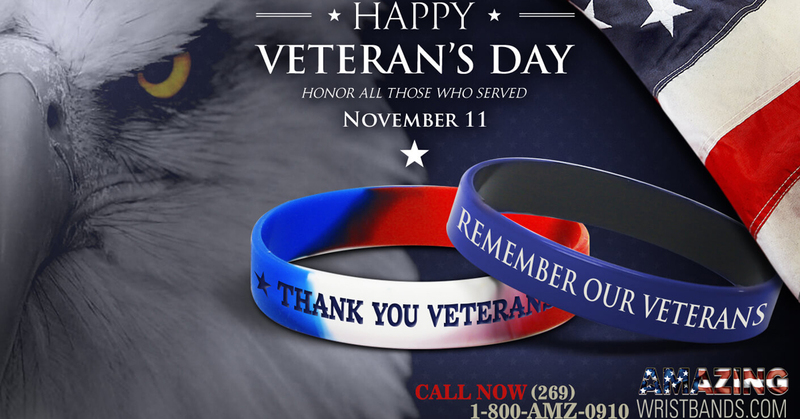 In addition to half-inch standard wristbands, AmazingWristbands.com also offers super popular slap bands that “snap” to a person’s wrist, as well as thin half-inch bands, thicker one-inch bands, adjustable bands, USB bands, silicone rings, and silicone key chains. Build your own wristbands online! 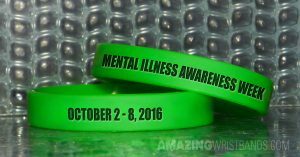 Custom designed silicone bracelets to support Malnutrition awareness week. This is the fifth year for this country’s observance of Malnutrition Awareness Week, which is designated as September 26 through 30, 2016. 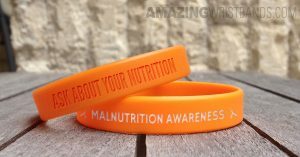 The purpose of Malnutrition Awareness Week is to give healthcare professionals visibility to the issue of malnutrition, particularly during hospital stays, and to educate the public about advocating for their own nutrition. Malnutrition Awareness Week offers many educational opportunities and resources for those in healthcare as well as for those who are patients or could become hospitalized.